GRAND RAPIDS, Mich. (WOTV) - It is officially Lent, which means fish fry Fridays are back! 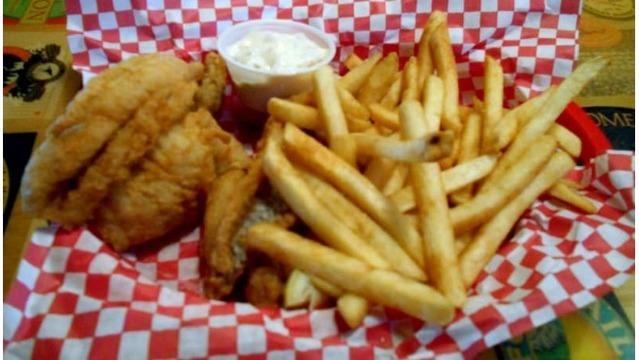 Check out the list of local fish fry locations and find one in your area. Did we forget any? Email us and we'll add it to the list. Fridays, March 8- April 5; 5-7 p.m. Menu: Choice of 3, 2, or 1-piece fried or baked fish dinner, butterflied shrimp, crawfish etouffee, seafood gumbo, fish tacos, mac & cheese, or the soup, baked potato, grilled cheese combo. Sides include: mac & cheese, baked potato, French fries, French bread, salad or slaw. Also available: $1 hush puppies. Friday nights, January 25- April 19 ; 5-7 p.m. Cost: $9 adults, $4 children 5-12, FREE for children 4 & under. Menu: All you can eat fish, potatoes, rolls, coleslaw, jello, and a beverage. Fridays, 11 a.m. - 2 a.m. Menu: Lake perch dinner weekly special. Fridays, March 8 - April 19; 5-7 p.m. Cost: $10 adults, $5 children 12& under, $25 family of 4-5. Fridays, March 8- April 12; 4-7 p.m. Cost: $9 adults, $5 children. Menu: Fried and baked cod, French fries, mac-n-cheese, coleslaw and roll. Friday nights, including Good Friday, 4:30-7 p.m. Menu: Fried Alaskan polluck, fries, coleslaw, bread & butter, dessert, coffee and milk. Carry-out available. Friday nights, March 8- April 19; 5-7 p.m. Cost: $10 adults, $5 children 6-12, FREE for children 5 & under. Menu: All you can eat Alaskan Pollok or Smelt, with coleslaw, French fries, dinner roll. Fridays, March 8- April 19 ; 5-7 p.m.
Friday nights, March 9 - March 23; 4:30-7:30 p.m. Cost: $9 adults, $8 seniors, $5 children 5-12, FREE for children 4 & under. $30 per family of 4+. Menu: Choice of Fried or Baked Pollock, Cole Slaw, Green Beans, Applesauce, Choice of French Fries or Macaroni & Cheese, Bread & Butter, Dessert, Coffee, Lemonade, Water. Fridays, 11 a.m. - 9 p.m.
Cost/Menu: $8.99 for a single portion, served with Brew City Fries. Cost: adult fish: $9, adult pasta: $6, Children’s dinner: $4, FREE for children 3 & under. Menu: Alaskan cod (baked or fried), French fries or baked potato, Cole slaw or applesauce, roll OR Pasta dinner, meatless tomato or butter sauce, salad and breadstick. Every Friday, open until 8 p.m. Menu: all-you-can-eat Icelandic cod, fries and coleslaw. 5 p.m. to 7 p.m. each Friday through Lent. Cost: $10 adults, $9 seniors; $5 children 12 & under; $45 to feed a complete immediate family. Menu: All you can eat fried and baked Alaska pollock, baked potatoes and french fries, green beans, coleslaw, homemade mac n cheese, beverages, and desserts. Take-out is available. Handicap accessible. March 8, March 15, March 22, March 29, April 5, April 12, April 19; 4:30-7 p.m. Cost: $10 adults, $8 seniors, $5 children 12 & under, FREE for children 5 & under. Menu: All you can eat fried fish, french fries, green beans, slaw, mac n cheese, garlic bread. Friday, April 4, 5-7 p.m. Cost: $9 adults, $8 seniors, $5 children 5-10, FREE for children 4 & under. Menu: Fried or baked fish, French fries or baked potato, coleslaw, roll, dessert. Fridays, March 8- April 12; 5-7 p.m. Menu: All you can eat baked & fried cod, mac & cheese, fries, coleslaw, applesauce, cornbread, juice, coffee. Dine in or take out. Menu: Kosciuszko Hall Lent menu varies each week. Fridays, 5 p.m. - 9 p.m.
Friday nights, February 22 - April 19; 5- 8 p.m. Cost:$9 adults, $4.50 children 4-12. Menu: All-U-Can Eat Fish, served with choice of fries, baked potato or mac n cheese, includes coleslaw & drink…OR…Large beef and bean burrito with tortilla chips & drink. All meals include a beverage and dessert. Friday, March 8- April 12; 4:30-7:30 p.m. Cost: $10 adults, $8 seniors, $4 children 4-12, FREE for children under 3. Menu: Baked or fried walleye, French fries or baked potato, mac & cheese, coleslaw, sourdough roll, beverages, desserts, grilled cheese sandwiches. Fridays, March 8,15, 22, 29- April 5 & 12; 4:30-7 p.m. Cost: $10.00 adults, seniors 62+ $9.50. $5 children 5-12, FREE for children 4 & under. Menu: Baked or fried Alaskan pollock, french fries or baked potato, coleslaw or applesauce, homemade macaroni and cheese, rolls, dessert, beverage; take-outs available. Friday nights, March 8 - April 12 (there isn't a fish fry on Good Friday); 4:30-7 p.m. Cost: $10 adults, $9 for seniors (age 60 and over), $5 for children age 5-12. FREE for children 4 & under. Menu: All-you-can-eat fried Fried Pollack, baked Icelandic cod, baked potato or fries, coleslaw, roll, drink and ice cream. Macaroni and cheese available for children. Take out available. Fridays of Lent (March 8, 15, 22, 29 and April 12 – no fish fry April 5); 5-7 p.m. Cost: $10 for adults, $9 seniors, $30 family rate. Free for ages 5 and under. Menu includes: All-you-can-eat fish (baked or fried), french fries, coleslaw, mac and cheese, vegetables, rolls and butter, clam chowder and deserts. Friday nights, March 2, 9, & 16; 5-7 p.m. Cost: $9 adults, $5 children 5-10. Menu: all you can eat corn meal battered fried fish, French fries, cole slaw, rolls and butter, homemade desserts. March 8, 22 and April 12, 5-7:30 p.m. Menu: A twist on the traditional fish fry: Baja Fish Tacos, fried mahi mahi on corn tortillas, make-your-own taco with numerous toppings. Rice and refried beans. Water and lemonade. Friday nights, March 8- 22 and April 12; 4:30-7 p.m. Menu: Choose from famous fried lake perch, fried shrimp, perch and shrimp combo or baked salmon. New this year: $12 walleye. Sides include fries/baked potato, garlic toast, coleslaw, dessert and beverage. Kids' options include mac n' cheese, fish or cheese pizza. Fridays, March 8- April 12; 4:30-7 p.m. Cost: $10 adults, $4 children 6-12, FREE for children 5 & under, $35 per family of 4. Seniors. Menu: Deep-fried and baked pollock, french fries, green beans, dinner roll, mac & cheese, coleslaw, salad bar and dessert. Cost: $10 adults; $8 seniors, $4 for children 12 years old, $25 family of 4, $30 family of 5-6. Menu: Choice of perch or tilapia served with french fries or baked potato, homemade coleslaw, dessert, applesauce, and a beverage. Ala Carte: Doo Drop-in Onion Rings. Fridays, Feb. 1- March 29; 4:30-7:30 p.m. Menu: Choice of perch, shrimp or combination; choice of red skin potatoes or French fries; coleslaw, garlic bread and dessert. Cost: $11-13 adults, $5 children 5-12 years old, children under 5 years old free. Menu: Choice of fired fish, baked cod, Atlantic salmon, or shrimp plate; all dinners include a drink, roll, and choice of 2 sides: French fries, coleslaw, mac & cheese, green beans, carrots, Haluski, or applesauce. For take-out, call after 4:15 pm. Friday nights, March 8- April 12; 5- 8 p.m. Menu: Perch, polluck, shrimp, and chicken dinners. Friday nights, March - April; 4-8 p.m. Menu: ½ lb. fried fish, side, hush puppies.